DCIM Market size was estimated at over USD 800 million in 2017 and is predicted to grow at over 20% CAGR from 2018 to 2024. The DCIM market is predicted to grow oevr the forecast timeframe due to rising focus on big-data analytics and large-scale data center construction activities undertaken by organizations displaced across the world, irrespective of their operating sectors. To sustain continuous growth in the marketplace, accumulation and management of consumer data have become critical components of business operations owing to which there is a high expenditure on computing and storage needs. The players aid in reducing the system downtime by controlling the various activities of a data center such as cooling and power management, installation & integration, and management of the overall infrastructure. Additionally, there is a high focus on the adoption of the DCIM market by SMBs. A major factor aiding the DCIM market growth is the rising trend of digitalization and transition to cloud-based infrastructures as these aid in significantly reducing lowering operating expenses and accommodating high-capacity demands. Additionally, these aid in the effective management of essential resources such as storage and personnel and assigning them in areas of higher needs. The high costs pertaining to the development of software solutions and the need for highly specialized staff to develop these solutions are anticipated to restrain market growth. However, the availability of low-cost labor and abundance of highly trained personnel, primarily in regions of the Asia Pacific and South America, will contribute to the growth of the DCIM market in the long term by driving down the costs of development and provision of these software and solutions. Additionally, the complexity of data center architecture and inadequate financial funds to deploy and manage services are impeding the industry growth. The DCIM market service segment holds immense potential to grow over the future. The data center technology is gaining rapid traction in the global space owing to which end users are increasingly installing and deploying these services and appointing skilled personnel, having an in-depth knowledge of the infrastructure management to handle activities such as identifying requirements pertaining to the size and capacity, fault identification, data management, and security management. 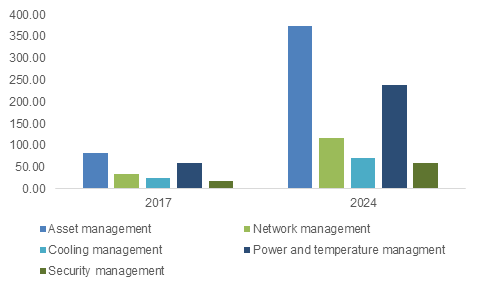 The solution segment of the DCIM market is growing rapidly in the industry owing to large demand for the software solutions including asset management and power management. IT asset management solutions; for instance, aid in improving business processes, ensuring hardware and software compliance, and managing data that can be used in making strategic business decisions. Furthermore, security also is an essential component of these systems as they can lead to massive losses in financial funds, confidential data, and reputational losses. For instance, in April 2015, HSBC suffered a security breach in its data centers, which led to massive losses in the confidential client information. The DCIM market penetration in several end-use industries indicates that the IT and Telecom sectors are the largest consumers of these services and software solutions. The industry is characterized by the rapid adoption of advanced technologies such as cloud infrastructures and big data analytics. The growth can be also attributed to the enormous volume of data generated by the businesses requiring adequate storage and the demand for improving service levels. The BFSI and healthcare sector in the DCIM market is anticipated to be exhibit the highest growth owing to the high scale of modernization of the IT infrastructure to accommodate a large amount of client data. To enhance business performance, reduce costs, and streamline operations, companies operating in the IT industry are increasingly focusing on the deployment of data centers. The U.S. DCIM market is anticipated to continue dominate the industry due to the favorable conditions supporting data center adoption such as a highly developed broadband infrastructure. Countries including the U.S. are early adopters of new and advanced technologies and they focus on energy-efficient and green data centers. However, the growth of the DCIM market is anticipated to witness a slower growth in the coming years owing to government orders to freeze the construction of federal data centers and closing down of approximately USD 1 billion worth of data centers in the U.S. The industrial boom in the Asia Pacific region, primarily in emerging economies including India and the Philippines, owing to the government support for SMBs is a major factor driving the growth of the DCIM market in this region. Additionally, government initiatives, such as smart nations, the Ministry of Industry and Information Technology (MIIT) in China, have initiated the issuance of Internet data center (IDC) licenses to local vendors for extensive connectivity, further increasing the data centers’ demand in the country, providing a strong platform for the growth. 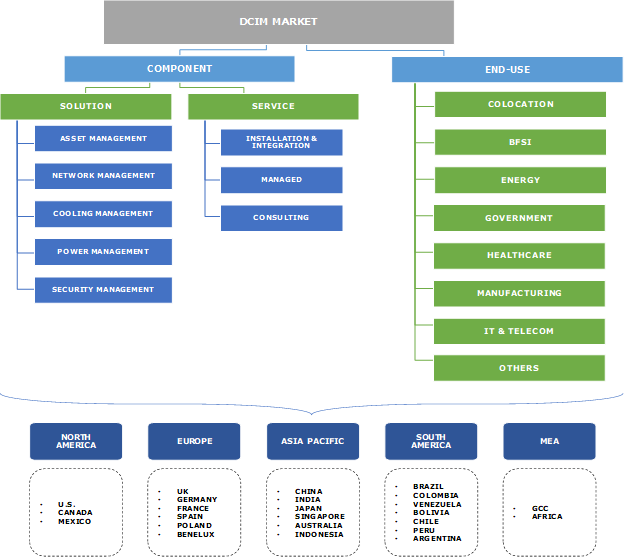 The vendors in the DCIM market include companies such as ABB Ltd., CA Technologies, Cisco Systems, Inc., CommScope, Inc., Rittal GmbH & Co., KG, Schneider Electric, Siemens AG, STULZ GmbH, and Vertiv Co. Companies are required to invest in activities, such as mergers and acquisitions, partnerships, and service and solution expansions, to strengthen the growth in the DCIM market. In November 2017, HPE announced a strategic partnership with ABB Ltd. with an aim to combine HPE’s hybrid IT solutions with ABBs digital offerings. Under the partnership, the companies are anticipated to provide services such as data center automation, power, and cooling to data center users. The DCIM market is gaining momentum at a very rapid pace. The industry is, at present, fragmented, and constitutes a few players. But the high lucrativeness of the industry is anticipated to contribute to the increase in players in the coming years. Consumer demands are constantly fluctuating and, in most cases, susceptible to be evolving with advancements in technology, regulations, and the scalability of their business activities within the region. In such a case, the players aid in identifying the requirements and presenting consulting services to aid businesses. They are also required to help in organizing and managing the information stored in a data center. Growing government focus on the reduction of energy consumption by data centers is projected to drive the DCIM market. Data centers in the U.S..; for instance, are estimated to consume approximately 1.8% of the total electricity and are projected to consume 73 billion kWh by 2020. Additionally, cooling demands of a data center constitute 40% of the power consumed by it. In such cases, there is a high focus on the effective management of the infrastructure and rising prominence of green data centers, which will reduce the consumption from traditional power sources.